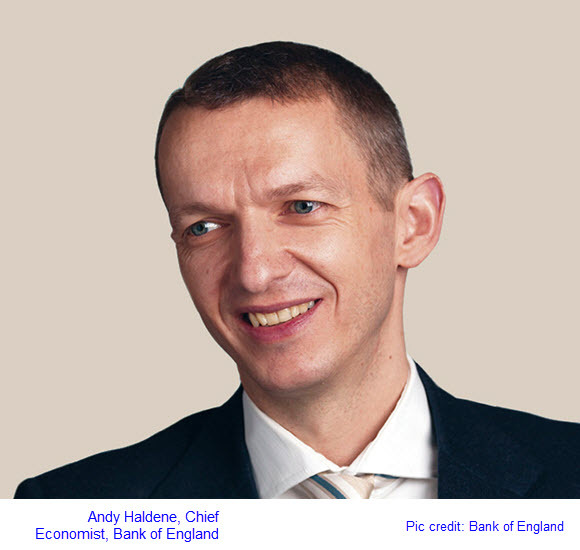 The chief economist of the Bank of England, Andy Haldene (above), who also sits on the central bank’s monetary policy committee (MPC), the body that has responsibility for deciding on such things, has suggested that the next move in UK interest rates could be down, instead of up, as the Forex and other markets have been expecting for some time. He bases his assessment on global risks, the most significant of which are out of China, and the resolute refusal of inflation to increase in all major economies despite the most unconventional and sustained policies that are designed to drive it up to around the 2% level. Mr. Haldene’s theory is that the current turmoil in China, taking in equity markets as well as the economic wellbeing of that country, is part of a connected global pattern that is now in its third phase. Phase one was the global financial crisis of 2008, while phase two has been the upset in the Euro zone in 2011 – 2012 that engulfed peripheral member states in particular. The Bank of England has room to reduce rates – the core level now stands at 0.5%, while in the US the level is half that, at 0.25%. In Europe, the ECB has set the minute figure of 0.05% as its benchmark. Its overnight bank deposit rate is a negative figure, -0.20%. Any question mark over the commitment of the Bank of England to raise rates as the next move, coupled with what is now perceived as a softening of economic indicators for the UK, will impact negatively on the pound sterling. At 15:00 CET today, Mario Draghi, President of the ECB, will give the introductory statement to the quarterly hearing of the Committee on Economic and Monetary Affairs (ECON) of the European Parliament in Brussels. Mr. Draghi’s presentations to this and to other events are always highly detailed and often informative. The markets will be hanging on his every word, seeking indications as to whether or not Quantitative Easing (QE) in the Eurozone is likely to be accelerated and / or extended.